Our niche is Medium to small size organizations and businesses. We offer Personalized service, Experience and Original creative. Jafla graphics uses interactivity in web media & navigation to create a visually interesting web experience. Jafla design helps your web site meet visitor expectations We integrate site content and visuals with existing elements and company and product branding. Inserted animations graphics and video media is custom tailored to your audience. Visuals are specifically created to relate to and expresses your product, services and web site content. We help extend your Branding, image, and logo beyond your own web pages and into social networks and communication portals like TWITTER, YOUTUBE and FACEBOOK. We establish your logo identity in icon format, complete with its own reflection. Extend your marketing campaigns on social sites. Contact us to find out how we can make it happen. Web site Sample: Corporate web page sample. 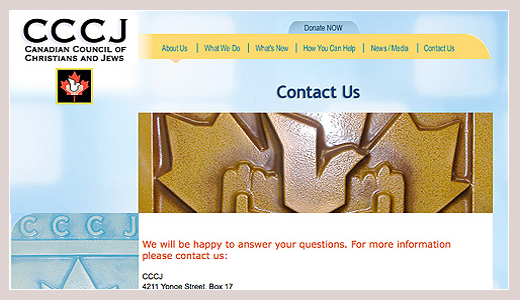 Amalgamated all areas of the CCCJ corporate website. From web site edits, changes, updates and maintenance to new designs and graphic content Jafla design accomdates your smaller needs. - All done with an artist's eye. With the use of GOOGLE ANALYTICS on your web pages, you can analize an the web traffic on your website. This new technology allows you to make changes to your web site to increse traffic and improve your content delivery.